For the history of the lunar distance method, see History of longitude. Finding Greenwich time while at sea using a lunar distance. The lunar distance is the angle between the Moon and a star (or the Sun). The altitudes of the two bodies are used to make corrections and determine the time. In celestial navigation, lunar distance is the angular distance between the Moon and another celestial body. The lunar distances method uses this angle, also called a lunar, and a nautical almanac to calculate Greenwich time. That calculated time can be used in solving a spherical triangle. The method was published in 1763 and used until about 1850 when it was superseded by the marine chronometer. A similar method uses the positions of the Galilean moons of Jupiter. In celestial navigation, knowledge of the time at Greenwich and the measured positions of one or more celestial objects allows the navigator to calculate latitude and longitude. Reliable marine chronometers were unavailable until the late 18th century and not affordable until the 19th century. After the method was first published in 1763 by British astronomer royal Nevil Maskelyne, based on pioneering work by Tobias Mayer, for about a hundred years (until about 1850) mariners lacking a chronometer used the method of lunar distances to determine Greenwich time as a key step in determining longitude. Conversely, a mariner with a chronometer could check its accuracy using a lunar determination of Greenwich time. The method saw usage all the way up to the beginning of the 20th century on smaller vessels that could not afford a chronometer or had to rely on this technique for correction of the chronometer. The method relies on the relatively quick movement of the moon across the background sky, completing a circuit of 360 degrees in 27.3 days (the sidereal month), or 13.2 degrees per day. In one hour it will move approximately half a degree, roughly its own angular diameter, with respect to the background stars and the Sun. Using a sextant, the navigator precisely measures the angle between the moon and another body. That could be the Sun or one of a selected group of bright stars lying close to the Moon's path, near the ecliptic; Regulus was particularly commonly used. 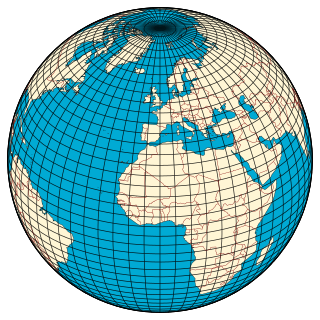 At that moment, anyone on the surface of the earth who can see the same two bodies will, after correcting for parallax error, observe the same angle. The navigator then consults a prepared table of lunar distances and the times at which they will occur. By comparing the corrected lunar distance with the tabulated values, the navigator finds the Greenwich time for that observation. Knowing Greenwich time and local time, the navigator can work out longitude. Local time can be determined from a sextant observation of the altitude of the Sun or a star. Then the longitude (relative to Greenwich) is readily calculated from the difference between local time and Greenwich Time, at 15 degrees per hour. Having measured the lunar distance and the heights of the two bodies, the navigator can find Greenwich time in three steps. Almanac tables predict lunar distances between the centre of the Moon and the other body (published between 1767 and 1906 in Britain). However, the observer cannot accurately find the centre of the Moon (or Sun, which was the most frequently used second object). Instead, lunar distances are always measured to the sharply lit, outer edge ("limb") of the Moon (or of the Sun). The first correction to the lunar distance is the distance between the limb of the Moon and its center. Since the Moon's apparent size varies with its varying distance from the Earth, almanacs give the Moon's and Sun's semidiameter for each day. Additionally the observed altitudes are cleared of semidiameter. Clearing the lunar distance means correcting for the effects of parallax and atmospheric refraction on the observation. The almanac gives lunar distances as they would appear if the observer were at the center of a transparent Earth. Because the Moon is so much closer to the Earth than the stars are, the position of the observer on the surface of the Earth shifts the relative position of the Moon by up to an entire degree. The clearing correction for parallax and refraction is a relatively simple trigonometric function of the observed lunar distance and the altitudes of the two bodies. Navigators used collections of mathematical tables to work these calculations by any of dozens of distinct clearing methods. The navigator, having cleared the lunar distance, now consults a prepared table of lunar distances and the times at which they will occur in order to determine the Greenwich time of the observation. These tables were the high tech wonder of their day. Predicting the position of the moon years in advance requires solving the three-body problem, since the earth, moon and sun were all involved. Euler developed the numerical method they used, called Euler's method, and received a grant from the Board of Longitude to carry out the computations. Having found the (absolute) Greenwich time, the navigator either compares it with the observed local apparent time (a separate observation) to find his longitude, or compares it with the Greenwich time on a chronometer (if available) if one wants to check the chronometer. In the early days of lunars, predictions of the Moon's position were good to approximately half an arc-minute, a source of error of up to approximately 1 minute in Greenwich time, or one quarter degree of longitude. By 1810, the errors in the almanac predictions had been reduced to about one-quarter of a minute of arc. By about 1860 (after lunar distance observations had mostly faded into history), the almanac errors were finally reduced to less than the error margin of a sextant in ideal conditions (one-tenth of a minute of arc). The best sextants at the very beginning of the lunar distance era could indicate angle to one-sixth of an arc-minute and later sextants (after c. 1800) to 0.1 arc-minutes, after the use of the vernier was popularized by its description in English in the book Navigatio Britannica published in 1750 by John Barrow, the mathematician and historian. In practice at sea, actual errors were somewhat larger. Experienced observers can typically measure lunar distances to within one-quarter of a minute of arc under favourable conditions, introducing an error of up to one quarter degree in longitude. If the sky is cloudy or the Moon is "New" (hidden close to the glare of the Sun), lunar distance observations could not be performed. A lunar distance changes with time at a rate of roughly half a degree, or 30 arc-minutes, in an hour. The two sources of error, combined, typically amount to about one-half arc-minute in Lunar distance, equivalent to one minute in Greenwich time, which corresponds to an error of as much as one-quarter of a degree of Longitude, or about 15 nautical miles (28 km) at the equator. The work of the lunarian, though seldom practised in these days of chronometers, is beautifully edifying, and there is nothing in the realm of navigation that lifts one’s heart up more in adoration. ^ a b c d e f g h Norie, J. W. (1828). New and Complete Epitome of Practical Navigation. London. p. 222. Archived from the original on 2007-09-27. Retrieved 2007-08-02. ^ a b Norie, J. W. (1828). New and Complete Epitome of Practical Navigation. London. p. 221. Archived from the original on 2007-09-27. Retrieved 2007-08-02. ^ Taylor, Janet (1851). An Epitome of Navigation and Nautical Astronomy (Ninth ed.). p. 295f. Retrieved 2007-08-02. ^ Bowditch, Nathaniel (2002). "Chapter 1" . The American Practical Navigator . Unites-States: National Imagery and Mapping Agency. p. 7 – via Wikisource. Wepster, Steven. "Precomputed Lunar Distances". Retrieved 2007-08-02. ^ Norie, J. W. (1828). New and Complete Epitome of Practical Navigation. London. p. 226. Archived from the original on 2007-09-27. Retrieved 2007-08-02. ^ Norie, J. W. (1828). New and Complete Epitome of Practical Navigation. London. p. 230. Archived from the original on 2007-09-27. Retrieved 2007-08-02. ^ Dunlop, G.D.; Shufeldt, H.H. (1972). Dutton's navigation and Piloting. Annapolis, Maryland, USA: Naval Institute Press. p. 409. |access-date= requires |url= (help) The authors show an example of correcting for lunar semidiameter. ^ Duffett-Smith, Peter (1988). Practical Astronomy with your Calculator, third edition. p. 66. ^ Montenbruck and Pfleger (1994). Astronomy on the Personal Computer, second edition. pp. 45–46. ^ Schlyter, Paul. "The Moon's topocentric position". Navigation is a field of study that focuses on the process of monitoring and controlling the movement of a craft or vehicle from one place to another. The field of navigation includes four general categories: land navigation, marine navigation, aeronautic navigation, and space navigation. A sextant is a doubly reflecting navigation instrument that measures the angular distance between two visible objects. The primary use of a sextant is to measure the angle between an astronomical object and the horizon for the purposes of celestial navigation. The estimation of this angle, the altitude, is known as sighting or shooting the object, or taking a sight. The angle, and the time when it was measured, can be used to calculate a position line on a nautical or aeronautical chart—for example, sighting the Sun at noon or Polaris at night to estimate latitude. Sighting the height of a landmark can give a measure of distance off and, held horizontally, a sextant can measure angles between objects for a position on a chart. A sextant can also be used to measure the lunar distance between the moon and another celestial object in order to determine Greenwich Mean Time and hence longitude. 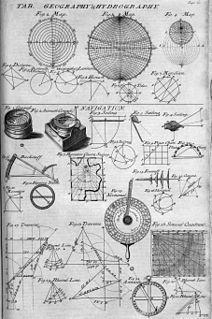 The principle of the instrument was first implemented around 1731 by John Hadley (1682–1744) and Thomas Godfrey (1704–1749), but it was also found later in the unpublished writings of Isaac Newton (1643–1727). Additional links can be found to Bartholomew Gosnold (1571–1607) indicating that the use of a sextant for nautical navigation predates Hadley's implementation. In 1922, it was modified for aeronautical navigation by Portuguese navigator and naval officer Gago Coutinho. Jean-Charles, chevalier de Borda was a French mathematician, physicist, and sailor. Celestial navigation, also known as astronavigation, is the ancient and modern practice of position fixing that enables a navigator to transition through a space without having to rely on estimated calculations, or dead reckoning, to know their position. 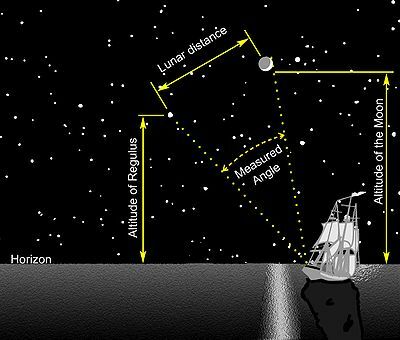 Celestial navigation uses "sights", or angular measurements taken between a celestial body and the visible horizon. The Sun is most commonly used, but navigators can also use the Moon, a planet, Polaris, or one of 57 other navigational stars whose coordinates are tabulated in the nautical almanac and air almanacs. The history of navigation is the history of seamanship, the art of directing vessels upon the open sea through the establishment of its position and course by means of traditional practice, geometry, astronomy, or special instruments. A few people have excelled as seafarers, prominent among them the Austronesians, their descendants the Malays, Micronesians, and Polynesians, the Harappans, the Phoenicians, the ancient Greeks, the Romans, the Arabs, the ancient Indians, the Norse, the Chinese, the Venetians, the Genoese, the Hanseatic Germans, the Portuguese, the Spanish, the English, the French, the Dutch and the Danes. The history of longitude is a record of the effort, by astronomers, cartographers and navigators over several centuries, to discover a means of determining longitude. Longitude: The True Story of a Lone Genius Who Solved the Greatest Scientific Problem of His Time is a best-selling book by Dava Sobel about John Harrison, an 18th-century clockmaker who created the first clock (chronometer) sufficiently accurate to be used to determine longitude at sea—an important development in navigation. The book was made into a television series entitled Longitude. In 1998, The Illustrated Longitude was published, supplementing the earlier text with 180 images of characters, events, instruments, maps and publications. Josef de Mendoza y Ríos (1761–1816) was a Spanish astronomer and mathematician of the 18th century, famous for his work on navigation. The first work of Mendoza y Ríos was published in 1787: his treatise about the science and technique of navigation in two tomes. He also published several tables for facilitating the calculations of nautical astronomy and useful in navigation to calculate the latitude of a ship at sea from two altitudes of the sun, and the longitude from the distances of the moon from a celestial body. An azimuth compass is a nautical instrument used to measure the magnetic azimuth, the angle of the arc on the horizon between the direction of the sun or some other celestial object and the magnetic north. This can be compared to the true azimuth obtained by astronomical observation to determine the magnetic declination, the amount by which the reading of a ship's compass must be adjusted to obtain an accurate reading. Azimuth compasses were important in the period before development of the reliable chronometers needed to determine a vessel's exact position from astronomical observations.